Traditionally, the period from Memorial Day to Labor Day is the “100 deadliest days of summer” for teen drivers according to the National Safety Council. 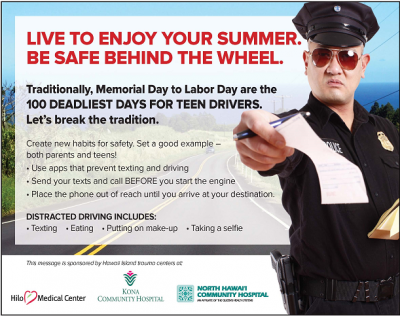 The goal of the summer-long campaign is to encourage drivers to break the tradition and stop texting while driving. The safety campaign will run on social medial platforms of the respective hospitals and will be included in the Hawaii Tribune-Herald, West Hawaii Today and on island-wide radio stations. When it comes to cell phones, new statistics show the real dangers of distracted driving. In February, the National Safety Council released preliminary data on motor vehicle deaths in the U.S. Data indicate that vehicular deaths increased 6% in 2015, bringing the nationwide two-year total increase to a staggering 14%. In Hawaii, the numbers reflect a similar trend. Tentative FARS (Fatal Analysis Reporting System) data indicate that in 2016 Hawaii had 64 motor vehicle occupant deaths, a 47% increase over the annual average of 44 deaths per year for the previous 5-year period. Honolulu and Hawaii counties account for the largest scale of overall increase in traffic crash-related fatalities. Texting is of heightened concern because it combines three types of distraction – visual, taking the eyes off the road; manual, taking the hands off the wheel; and cognitive, taking the mind off the road. According to the Insurance Institute for Highway Safety, drivers who text behind the wheel take their eyes off the road for an average of almost 5 seconds at a time. At 55 mph, that is the same as driving the entire length of a football field with your eyes closed. Campaign organizers at the Hawaii Island trauma centers hope that by raising public awareness, teens and adults will realize the real dangers of texting while driving , and will ultimately change their driving habits to help protect themselves, their families, friends and others on Hawaii County roads.